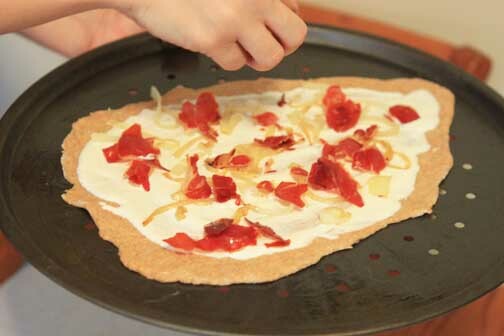 Diet It Up: Healthy Bacon Pizza. Yes…I said HEALTHY. Healthy Bacon Pizza. Yes…I said HEALTHY. "Trish, I have a Diet It Up challenge for you. Can you think of a way to healthy-up Tarte Flambée? It's a French flatbread covered in crème fraiche, bacon and onion. I feel like there's a healthy variant out there somewhere, I just can't quite find it." A healthy bacon pizza? I call that an oxymoron of epic proportions. Obviously my own brother was trying to set me up for a Saturday afternoon of eating failed pizza attempts (given my inability to throw anything away). I don’t know much about the French or their food. The last time I checked, Flambée was something set on fire. A quick search turned up a recipe from the beautiful blog, Smitten Kitchen. I was able to learn what the Alsatian specialty is supposed to look and taste like. 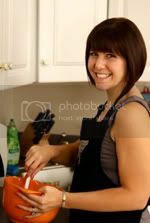 Her recipe gave me a great starting point to launch my own clever swap outs and culinary substitutions. First off, I made my own HONEY WHOLE WHEAT PIZZA DOUGH. I always take the lazy route and grab a frozen ball of dough from Whole Foods. That’s perfectly fine. But, if you want to go the extra mile and make your own dough, I highly recommend this one. The hint of honey adds a subtle sweetness that pairs perfectly with salty pizza toppings. I cut the ball of dough into 4 to make portion-controlled individual servings. The creamy “crème fraiche” base is made with a mixture of ricotta and sour cream (part-skim of course). 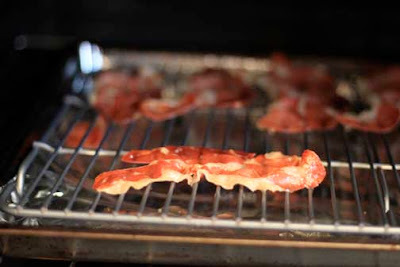 Instead of bacon, I made crispy, crumbled prosciutto by baking slices of it in the oven. The fat drips away from the meat leaving the same salty, smoky flavor with much less fat. I know the authentic flatbread is made with raw onions. 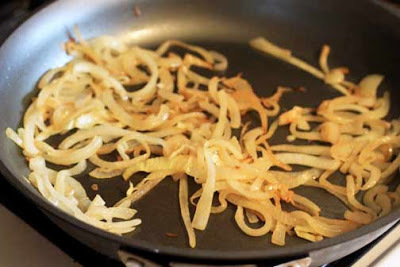 I don’t love the bite of so much raw onion, so I went with Smitten’s approach and very lightly caramelized them in some olive oil. They are melt-in-your mouth silky. 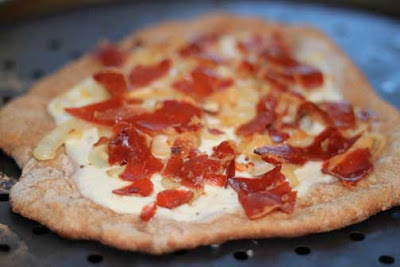 The final BACON & ONION PIZZA was a flavorful combination of salty and sweet, creamy and crunchy. It may not be the most “diet” of all things I’ve ever made, but it’s certainly a significant calorie reduction from the original. We ate the leftovers the next day for brunch with a runny, over easy fried egg on top…because runny fried eggs make every day just a little bit brighter. Do you have an idea for a Recipe Slimdown? Send me your gut busters and I’ll take a stab and turning them into waist slimmers. Come to the Dark (Leafy Greens) Side!